On this page, you will see Dr Emile Bitar through the eyes of those who knew him and followed his political and humanitarian activities. The page will incude a series of testimonials on Emile Bitar ranging from excerpts of newspaper articles to transcripts of TV broadcasts and speeches made either during Emile Bitar's life or at commemorative ceremonies and various other occasions. Authors of these articles or speeches are either political or religious figures, medical authorities or journalists and political commentators. Will soon be available articles and speeches by Marwan Hamadé, Edouard Honein, Ghassan Tueni, Karim Bitar, Rachid Solh, Fouad N. Boustany, Joseph Nasr, Joseph Moghaizel, Laure Moghaizel, Fouad Daaboul, Sami Minkara, Antoine Abdel Massih, Cardinal Antonios Khoreiche, Gedeon Mohasseb, Edgar Gedeon, Phares Zoghbi, Edouard Bassil, Marc Riachi, Charles Helou, Ibrahim Traboulsi, Samir Atallah, Nassir Barbir, Edouard Saab, Lucien Dahdah, Kamal Joumblatt, Michel Salhab, Joseph Khalil Asmar, Fouad Badawi, Daoud Sayegh, Kesra Bassil, Victor Mendelek, Antoine Ghossein, Mohammad Houmani, Camille Chamoun, Antoine Habis, Bassem El Jisr, Imam Moussa el Sadr, Rachid Karamé, Albert Moukheiber, Sleiman Frangie, Cardinal Nasrallah Sfeir, Daher Merhi Richa, Emile Abi Nader, and others. This page will also include other original forms of tribute, like the poem "The Heroic Battle" written by Lebanese Poet Saïd Akl, about Emile Bitar and his fight to reduce the prices of medicine, and lyrics of a song by Zajal legend Zaghloul el Damour about Emile Bitar the doctor who could heal Lebanon's wounds. Dr Emile Bitar... a figure, perhaps stronger than the man himself, that passed through the sky of Lebanese politics, and left an example. But came the war, which deleted, except the memory, all marks that were not synonymous with violence, or did not resort to violence as a means for political change. And Emile Bitar was one of those who refused violence. Some thought that he was rejecting politics altogether, that he was no longer trying to have an influence. But it was not so. Not at all. At the beginning of his presidential mandate, Sleiman Frangie wanted to create a new political class, that was neither heir to traditional politics, nor at the helm of a militia. And when Emile Bitar was summoned to the Presidential Palace, he arrived with his doctor's kit. He thought the President was sick and needed medical advice. Due to an old rivalry in Northern Lebanon between the Bitar and the Frangie families, he did not expect Sleiman Frangie to oversee this hostility and appoint him government minister. Emile Bitar was told that the President was in good health, that no one at the Presidential Palace was sick. He was told that the patient that needed his treatment was ... Lebanon. Or, at least, public health in Lebanon, which portfolio he was offered. Emile Bitar was reluctant, and explained at length that although he was not a traditional politician, he had strong political stands, and firm opinions regarding the Health issues in Lebanon. Emile Bitar's probity and professional conscience as a doctor, as well as his intellectual honesty compelled him to warn the President and the Prime Minister that he had reform plans, novel ideas, that his projects might force the government to enter in a harsh confrontation with powerful vested interests, a confrontation that few governments would welcome. "Carte blanche", he was told. "You are appointed minister. Fully Use your prerogatives". Emile Bitar did indeed use his prerogatives. And what was expected to happen happened. There came a time when Emile Bitar had to choose between two options : either he remains in government, but he would no longer be himself, or he chooses to remain Emile Bitar, to be faithful to his ideals, to his program, to his commitments, and he leaves power. Emile Bitar chose to remain faitful to his ideals and quit power. Similarly, an education minister, who also led a peaceful revolution in his department, resigned from this government. Because the Lebanese Government failed to understand that it was all too necessary to reform the system before it becomes too late. Thus, the question that comes to mind when one reflects about the legacy and memory of Emile Bitar is : "In Lebanon's future, shall we listen to those voices, shall we heed those who, like Emile Bitar, when they sense that a war or revolution is coming about, try to prevent this war by advocating peaceful and democratic reforms ? Or does every change in Lebanon require violence, requires the complete destruction of the regime, because the regime does not accept any political or intellectual reform ? It is an example that is worth being constantly mentioned to provide a complete view of who Emile Bitar was. He was the representative of a generation, a school of thought, a new political classwhich is nobility : the nobility of those who triumphed over the experience of government, the nobility cast of those who did not yield to the temptations that power induces, the nobility cast of those who dared to say no to violence... This noble cast represented by Emile Bitar should have been, and it must be, the road to the future of Lebanon." We are gathered today to pay tribute to a great patriot and humanist, who served his country and devoted to it all the resources and energy of his youth, who treated the illnesses of his country, healed its wounds through his dedicated actions, his important experience, his humanitarian spirit that often seemed to imprint on his deeds an apostolic touch. This martyr of humanism is Dr Emile Bitar. Emile Bitar was originated from this beautiful Lebanese region, Batroun, he was born and raised in Tripoli. He was educated in its schools and witnessed the peaceful coexistence of its habitants. Thus he realized, by practice that Batroun was the gate to North Lebanon, and Tripoli its capital, that North Lebanon was an indivisible entity, an essential part of a united Lebanon. The unity of Lebanon was Dr Emile Bitar's obsession, his main objective, as it is the obsession of Emile Bitar's family, his friends, his supporters and allies, in Batroun, in Tripoli, and on the whole territory of Lebanon, from North to South, from the coastal regions to the highest mountains. And around these social issues and Emile Bitar, the Lebanese people united as they never did before. The Lebanese people that foreign interventions often divided against itself, united against the merchants of the temple and it is those merchants of the temple who played a major role in ejecting Emile Bitar from power, because they were afraid, because they feared that they would be rooted out by the revolt of the Lebanese people and its just demands. Emile Bitar realized that there was a huge gap in Lebanon, an enormous democratic deficit, a crisis in society, a crisis in Lebanon's democracy. Through his work, his dealing with people, his itinerary, he developed several ideas fro curing this crisis. and he entered the political arena through his party, the Democratic Party. The two main issues in Lebanon's internal affairs were according to the Democratic party, democracy and secularism. Indeed, those are the two main issues that constitute the core of the Lebanese question, now that the identity issue has been settled. I will not enter today, into the details of what Emile Bitar meant by democracy and what he meant by secularism, but I would like to assert that Dr Emile Bitar the politician held the correct answer and the appropriate remedies to cure Lebanon from its numerous political and social problems. 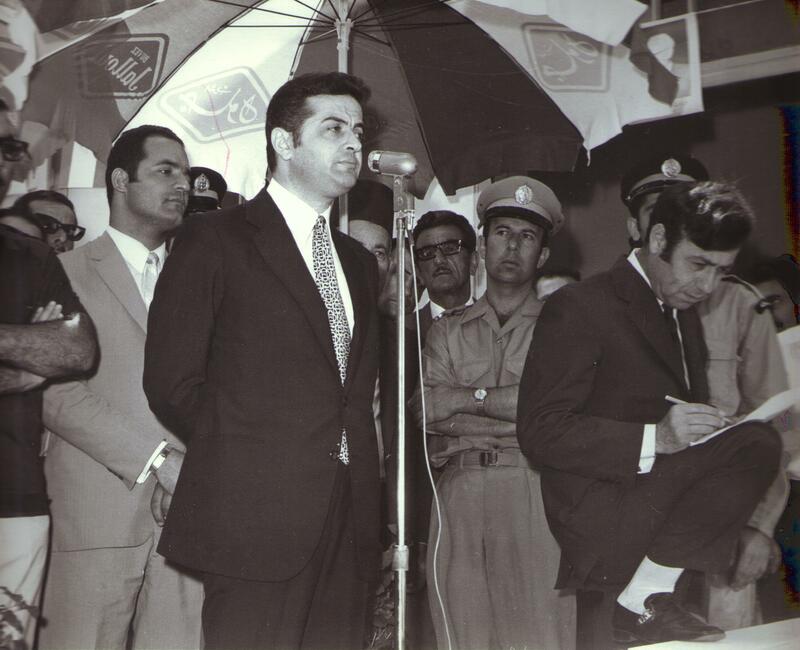 Emile Bitar was the example, the symbol, the epitome of honor, of integrity, of dignity, of commitment. These are the qualities he demonstrated throughout his political career. In the sixties and seventies, Emile Bitar was the major voice of Lebanon's youth, the voice that symbolized and carried their hopes, their fears and aspirations. As health minister, he was the first to tackle sensitive issues with the utmost competence, with the brilliant mind of an expert. He was the example of a government minister who perfectly masters the issues, who treats matters rigorously, with scientific expertise, with the responsibility of a statesman who puts the public interest, the higher interests of the Lebanese people above all personal interests. Emile Bitar was Lebanon's most popular and beloved public figure in this period of history, the foremost opinion leader. To this day, Emile Bitar's figure remains the most shining and popular one in Lebanon. In the long list of holders of high public offices, and I am one of them, rarely can we mention a name that would be brilliant and distinguished, but Emile Bitar is one of the very few who clean the long record of indignities and failures and who restore the honor of an entire political generation. Every single health minister who succeeded Emile Bitar from 1972 to this day, has been trying, unsuccessfully, to keep up with the legacy and standard set by Emile Bitar. Should I have only one ambition as a government minister, it would be to approach, even from afar, the standard of Emile Bitar, and follow his path. And those perhaps were the reasons why the obscure forces who work for a Farm-State, who work for petty interests, for patronage, united against Emile Bitar. And I would like to assert, on this occasion, particularly from here, from Batroun, that it was not Emile Bitar who lost the battle against monopolies in the pharmaceutical industry. It was a stunning defeat for the Lebanese people in its entirety, and it was one of the most fundamental causes for the burning of the Farm-State. This is how Lebanon fell victim of a tragic war, that carried so many catastrophes and destruction. And I would like to tell you Emile, that if the ideas of democracy and secularism seemed to have vanished during the war, the only way this peace will last is if we come back to these values for which you fought. Today, my departed colleague, I would like to say that the Lebanese Government, when it decided to give your name that is so beloved by the people to this hospital in Batroun, it decided in fact to support your vision, the values that were dear to you, and to promote democracy, in the full meaning of the word democracy, throughout Lebanon and to promote secularism, because a democratic and secular Lebanon would be a nation for all its children, a nation where justice, equal opportunities, competence would have the upper-hand. This is how we will be able to root out fanaticism and war, this is how we will secure a bright future for the coming generations. For those future generations, the name if Emile Bitar will remain a Pride for History and a Guiding Light for the Future. The tragedy of Emile Bitar is that he was born Lebanese. The truth is that in any other country on this earth, he would have occupied the very first rank. But Emile Bitar was born in Lebanon. And the poor Lebanese people, who knows so much about geopolitics, about international conflicts and regional conflicts, this people who is constantly discussing international conferences, the Middle East problem, the concordance or non concordance of the national and regional dossiers, can this poor people listen to the message of someone like Emile Bitar ? Emile Bitar was one of those birds who pass through the sky of Lebanon and die of sorrow. A man with no clan and no party but with a dream, a man with no dogma except forgiveness, a man with no soldiers other that the olive trees of Kfifane. A man who dreams on a summernight of a Lebanon that would be as beautiful as its blue sky. A Lebanon with a lot of stars and a lot of light. A Lebanon that would be very diverse but also very united. But when Emile Bitar woke up from his dream, he realized that the sky was full of vultures, that the horizon was gloomy and lugubrious, that the people, without even protesting, was being led to the slaughterhouse. Emile Bitar took his dream in his arms and walked without disturbing anyone. Emile Bitar was the first man who addresed the Lebanese people with the language of truth. He told this "grandiose" people : "They have been feeding you long speeches, articles, analysis, talk and talk and talk. They have been fooling you and misleading you. They have been digging your grave. They are depriving you of your right to dignity and to a decent life. Let's start working. Let's start somewhere. Let's start with the issue of the prices of medicine." Isn't the country sick because the citizens are sick ? A mountain of dreams, of ethics, of integrity, of calm, of benevolence of the heart. But the message of Emile Bitar was forgotten. Forgotten was the message of the very first Health Minister in the History of Lebanon. And we went to war. And the people stood once again and listened to all the empty speeches and did not miss a single one of them. Like many others, Emile Bitar attempted to resort to political action. And they were funny, Emile Bitar and Joseph Moghaizel and Bassem El Jisr, three intellectuals attempting to build a political party in a jungle, in the land of feudalism and clientelism and patronage. A party where all would meet, where everybody would have a place, a party that forgives, a party that dreams, a party that writes, a party that reads, a party that treats and heals. Where ? In Lebanon !!! How can a man of Emile Bitar's stature, of Emile Bitar's politeness, how can such a distinguished and elegant man dub political party such a gathering of dreamers ? I don't know. Emile Bitar's party headquarters was at a short distance from Emile Bitar's clinic. And the headquarters of Emile Bitar's party was just like Emile Bitar's clinic. Everybody walks in with his problems and goes out relieved. But the doctor himself lived with the worries. Emile Bitar was basically a dreamer. He dreamed other people. He simply dreamed. The dream for the dream. The dreamed Lebanon. Medication for the poor and the needy. A Rainbow Lebanon. A Lebanon that would be a great vase containing all of Lebanon's flowers. Containing all of Lebanon. The Christian Arab and the Muslim Lebanese. And all united in an independent Lebanon. In a free Lebanon. And all would be citizens living in dignity and would not be the victims of humiliation, neither the humiliation of not being able to afford medicine, nor the humiliation of those vultures surronding the Health Ministry. And Emile Bitar was indeed the first Health Minister Lebanon ever had. But Emile Bitar was in a valley and the "grandiose" people was in oratory festivals. Some tell him that he invented the alphabet and therefore he ought to die. Others tell him that he is at the vanguard of Arab Nationalism and therefore he ought to get killed. Emile Bitar advocated another choice : The Choice of Life. Yesterday, Emile Bitar died. The unique social battle that took place in the History of Contemporary Lebanon has a single hero, whose name is Emile Bitar. Alone in the ruling class, the man of the Batroun Rif stood up and led a fierce war against the pharmaceutical industry monopolists. Emile Bitar was not one of those ministers who merely sign the decrees, who attend to current affairs. He was not one of those who place their men and their partisans in the Ministry's administration. When the monopolists drew their spider and fought Emile Bitar, the Lebanese people, the Lebanese people in its entirety, stood with the courageous minister. He was not a manoeuvering man, not a demagogue and neither one of those self aggrandizing politicians. He was open, an advocate of dialogue and negotiation, he was a leader, cultured, honest, able to make decisions. And whenever the presidential elections approached, Emile Bitar was the outsider and the Lebanese people remembered him. Emile Bitar will remain in the memory of the Lebanese people, as long as this people will suffer from humiliation and injustice. If we had to sum up Emile Bitar in just two words, we would use the words Courage and Integrity. Words would not suffice if we were to quote all his qualities and distinctions. Of Emile Bitar the Minister, we retain a reference and a role model. His attitude vis-à-vis public affairs was very different from that to which we are unfortunately accustomed in our country. His upright attitude was unheard of in Lebanon. Emile Bitar firmly believed in a united undivisble Lebanon, in the coexistence of religious communities. Although he was educated in Christian schools, at the Freres in Tripoli and at the Jesuits in Beyrouth, although he went to medical School in Montpellier, France, Emile Bitar always remembered in his orientations and thinking the Arab World to which Lebanon belongs. As soon as he had returned to Lebanon in 1961, he started writing in newspapers and magazines about the political situation in the country, particularly the Health Care issues, Social Security and Administrative Reform. His writings expressed a sincere interest in public service, as well as nobility and unselfishness, a commitment to serving the national interest. This nobility led him to offer treatment and numerous services to a very large number of citizens, whether they were physically sick or requesting any other favour. Emile Bitar quickly noticed the flaws in Lebanon's democratic practice, in the relations between the Government and the Citizens. Thus, he founded the Democratic Party which was a striking phenomenon and a success in Lebanese politics. And it could have been a success in the long run had the war not ruined this experience, as it ruined Lebanon and many Lebanese. 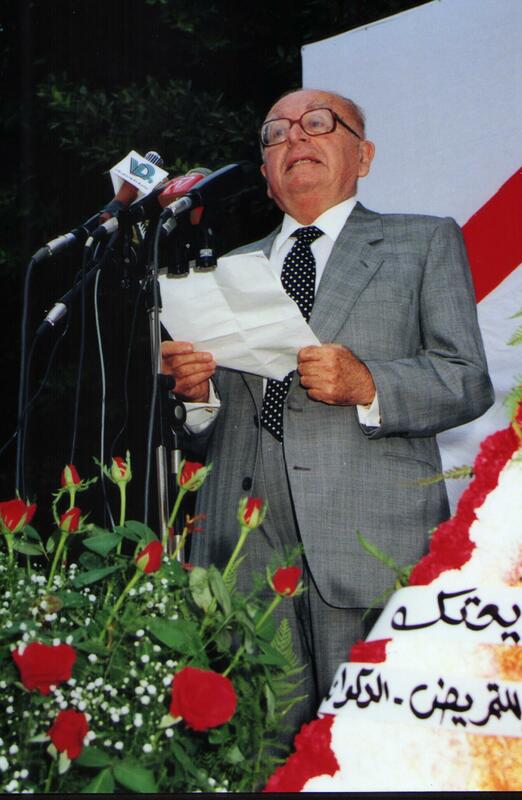 Emile Bitar was one of the most famous and eminent Lebanese who cautioned against the danger that the ambitions of regional powers could represent on Lebanon. And he was one of those who were most active in edifying a solid national unity that would allow Lebanon to be immune from foreign threats. Emile Bitar was the Lebanese who demonstrated the most enthousiasm and the biggest energy to succeed in this task. He was true to himself and to his ideals. 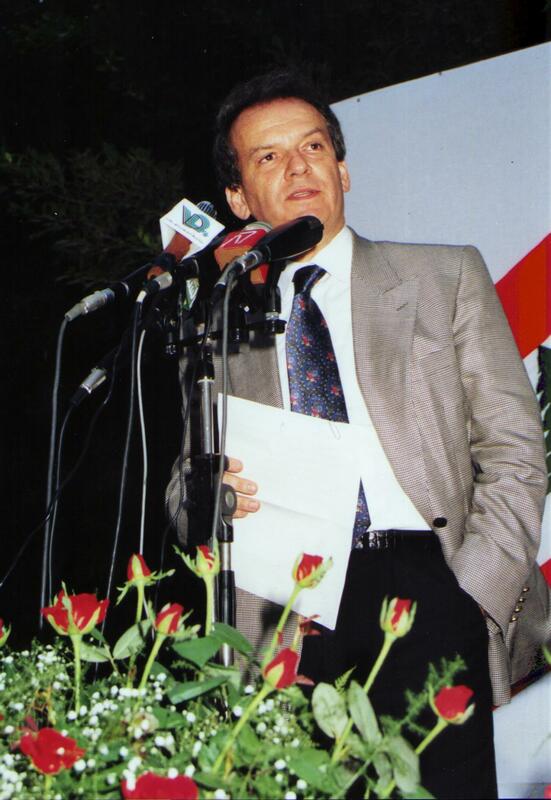 This is what he demonstrated when he resigned from Government with no regrets, because the most important thing according to him was to defend the interests of the citizens, of the sick, of the users of the medical system, to put an end to all the fraud, to put an end to all the embezzlement to which the Lebanese fell victims, to find a solution that would be in interest of all. Before passing away, Emile Bitar used to say : When in Lebanon, speaking would have a meaning once again, when the arms would be silenced, we will come back in politics and the Lebanese will have a say. Unfortunately for Lebanon, Emile Bitar fell in Eternal Silence before the weapons were silenced and Lebanon lost his ideas and political and moral stands. His memory, however, is indelible, because he had Courage and he had Integrity. I wish to thank Marwan Hamadé for paying him tribute, because the Lebanese people have an enormous debt toward Emile Bitar.